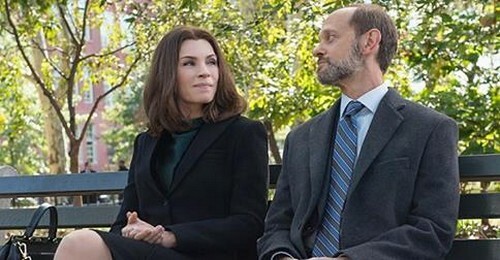 Tonight on CBS The Good Wife starring Julianna Margulies continues with an all new Sunday November 23, season 6 episode 10 called, “The Trial” and we have your weekly recap below. On tonight’s episode, Cary’s [Matt Czuchry] case goes to trial and he considers a plea deal that would send him to jail. Meanwhile, a joke between mother and daughter lands Alicia in trouble as her campaign for State’s Attorney shifts into full gear. On the last episode, Alicia faced a crisis of conscience when she was encouraged to go negative in her campaign for State’s Attorney. Meanwhile, the Feds tried to persuade Cary to work with them as they attempted to build a case against Lemond Bishop. David Hyde Pierce Returned as Frank Prady. David Krumholtz guest starred as campaign media specialist Josh Mariner. Did you watch the last episode? If you missed it, we have a full and detailed recap right here for you. Tonight’s season 6 episode 10 looks like it is going to be great and we’ll be updating it live for you beginning 9PM EST. Tonight’s episode of The Good Wife kicks off with Judge Cuesta arriving in the courtroom for Cary’s case. The judge mocks Alicia when he sees her sitting with the people, and says that he is surprised she found time from her campaign to join them. The judge calls a 402 meeting in his chambers and Cary and Diane meet with the DA. The judge pressures Cary to take a plea deal – and accept three years in prison. Diane and Cary meet with Alicia afterwards. Alicia wants Cary to go to trial and turn down the deal, but Diane points out that if he loses he will go to jail for 15 years. After they leave Judge Cuesta continues his hunt for Neil Diamond tickets. They head back to court and Diane announces they are turning down the plea deal – so it is time to begin jury selection. Alicia receives a call from Jackie – who tells her to come down to the school ASAP. Apparently Grace turned in a note to her teacher, and in the note Alicia threatened to stab Grace’s gym teacher if he didn’t excuse her from running. Alicia insists that it was a joke and she never meant it to go to school. Alicia heads to campaign headquarters where Eli is fuming – he doesn’t want Alicia to stand by Cary while he goes to trial because if he is convicted it will hurt their election. Johnny receives a phone call from a reporter who says that he got a tip that Alicia threatened – Johnny laughs that it was a joke. Then when he hangs up he learns that Alicia really did write the letter. At Cary’s case State’s Attorney Pine’s first witness takes the stand – it’s a detective who ordered the CI to wear the wire. Judge Cuesto is still rushing the case – and the jurors are fraternizing with each other. They play the tape for the jury. A man leaves SA Pine a note on her table telling her “we need to talk.” Meanwhile at Alicia’s campaign room – Eli and Johnny are freaking out over the letter. They tell Alicia that Grace needs to get the note back ASAP. Eli’s daughter tells them that they can spin it, and just say that it was all a joke. In court Diane is cross-examining the detective and wants to know when the last time was that he spoke to the criminal informant, Trey Wagner. SA Pine is off her game and Diane shuts her down on hear say. The detective confirms that Trey admitted he was turning the wire off and on to cut out parts of the conversation and make Cary appear more guilty than he was. Cary heads back to court and the state’s attorney calls Kalinda up on the stand as her next witness. She points out that Kalinda is Cary’s lover and Diane interjects – the judge agrees that whether they are lovers is irrelevant and tells the jury to disregard her statements. Frank Prady shows up at Alicia’s office and is furious because he thinks that her team leaked a story that he had an affair with two men. Alicia points out that he said in an interview that he would prosecute a mother if she threatened a teacher. She says they are even in the polls now – and she has no knowledge of her handlers leaking any information. Alicia meets with Grace’s teacher to get the note back – but the teacher reveals that she wants the state’s attorney’s office to support the teacher’s union again and give them an appointed member like there used to be. Alicia heads back to campaign headquarters and tells Eli ad John she couldn’t get the note because the teacher is trying to bully her with patronage. She refuses to be like Peter and cut deals with everyone to get votes. SA Pine gets the one juror that thought Cary was innocent booted out of the jury and convinces the judge that he has hearing problems. Cary tells Kalinda he needs her help because their case is sinking fast. Kalida calls Alicia and says that they need Bishop’s man Dante if they want to save the case. Alicia meets up with Finn and asks him to help them find Dante because he is the only person that can testify that the wire tap was edited. While they are sitting at the diner talking the power goes out – and a waitress puts a candle on their table so they can see. Finn says that he isn’t allowed to say anything – but he slips Alicia an envelope full of surveillance photos of Bishop’s house. Kalinda goes to Bishop’s house and shows him the surveillance photos – of known drug dealers entering his front door. She tells him that CPS will take his son away – if he doesn’t give them Dante. Bishop gives Kalinda Dante and they put him on the stand – but Dante lies and says that Cary told them exactly how to break the law without getting caught. Bishop informs Kalinda he is killing Cary’s case because Kalinda threatened him. Diane calls Dante off the stand before he does any more damage. SA Pines meets with Cary and Diane and tells Cary the best deal he will get is two years in prison or he could walk if he testifies against Bishop. He reveals that he cant testify against Bishop, Diane pressures him to take the two years but he says he needs to take a walk and get some air. Grace’s school holds a press conference and announces that the letter threatening to stab a teacher was all a huge misunderstanding. Johnny and Eli insist that they didn’t offer patronage to the teacher – they just had some empty seats left on the school’s board of safety and gave them to the teacher. While Cary is walking, Bishop pulls up and tells him to get in the car. He commends him for being good so far and offers to move him out of the country and get him an apartment, he’ll hire him as a legal consultant in Europe and he wants someone loyal like Cary. But, if he runs and is a fugitive – he will never be able to return. Cary says that he can’t go because the firm put up a million dollars to bail him out. Cary heads back inside and Alicia is waiting for him, she tells him that she wants him to go to trial and fight it. He doesn’t want to take the chance of going to trial and facing 15 years. Alicia argues to him that they can appeal it, but he tells her he has watched her work long enough to know that he doesn’t have a case. Alicia cries and hugs him and promises to come visit him. Cary heads back to court and pleads guilty and accepts the plea deal.